If movie special effects artists were to design a CGI-rendered swimming hole for some high-budget blockbuster set in the South Pacific, it would look like the Tosua Ocean Trench. Tosua is, in a word, perfect. Ringed by 30-meter high cliffs topped by lush foliage, this swimming hole is filled by warm, clear blue ocean water. Skilled divers can make their way into the swimming hole directly from the ocean via an underwater tunnel. But the more regular way in is to pay the $15 park fee (which will also give you admission into a nice, if underwhelming, tropical garden). Note that the way down to the water involves climbing down a rather precarious ladder — or jumping. Neither is for the faint hearted. 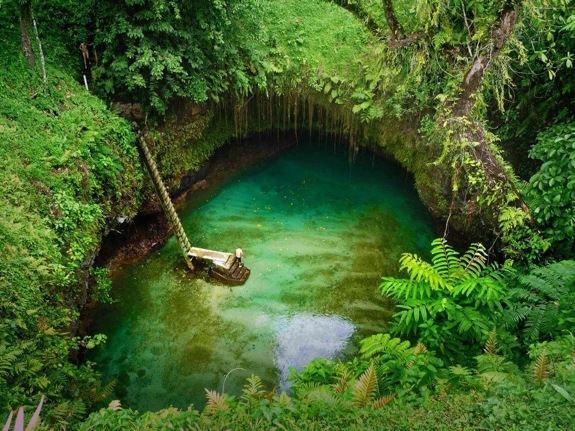 If you go: You’ll find the Tosua Ocean Trench near the village of Lotofaga, where the Fuipisia Falls is the other amazing attraction of natural beauty. 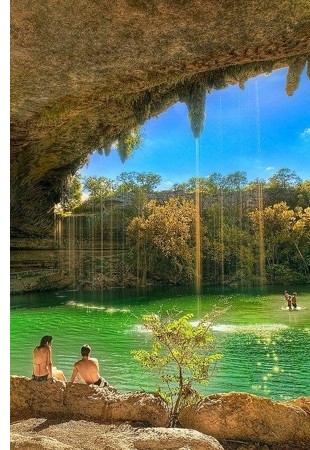 The Hamilton Pool, located in a grotto fed by a 50-foot high waterfall, is, at minimum, spectacular. Visit during a moist period, when the water gushes down and green moss grows from overhead stalactites, the pool transcends the spectacular and enters the world of the magical. 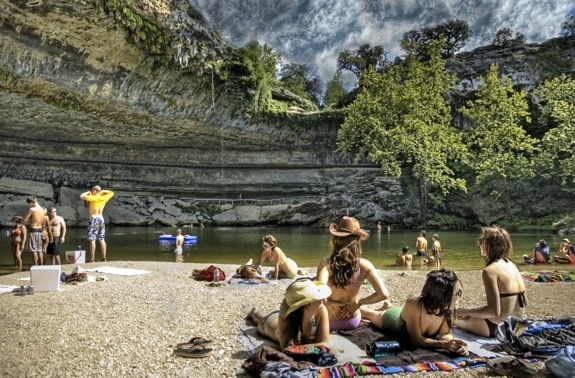 Check out this website if you are interested in other cool swimming holes around the state of Texas. If you go: The park only allows swimming when there’s enough water and it’s deemed safe — call 512-264-2740 to hear a recorded info for the day of your visit. The number of people allowed into the grotto is limited, so show up early if you don’t want to wait. From the parking lot ($10 per car) it’s a steep walk down to the pool; good shoes are suggested. Driving along Oman’s Route 17 between Muscat and Sur, you’ll see barren brown-rock landscape on one side of the road and the blue waters of the Gulf of Oman on the other. But, unless you know it’s there, you won’t see that virtually next to the highway awaits an unlikely swimming spot: the Bimmah Sinkhole. 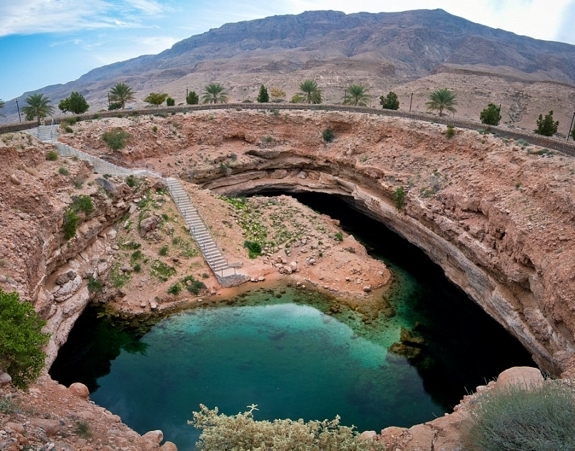 Its name in Arabic, Hawiyat Najm, translates as “meteor fall,” even though the cavernous 40-meter wide hole does not have such a celestial source. The English “sinkhole” is technically a misnomer too. 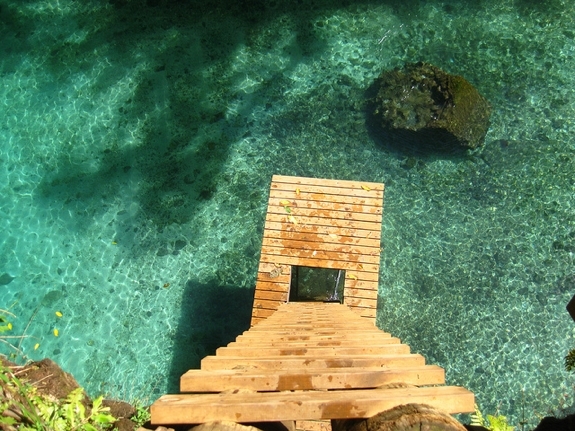 Really, what you are swimming in is an ocean trench (like Tosua, see above) since it is connected to open waters by an underground tunnel. A swim in the Bimmah Sinkhole is not for the ticklish — little fish nibble at swimmer’s feet. If you go: The Bimmah Sinkhole is easy to miss. Look for the brown sign pointing to Hawiyat Najm a little south of the villege of Didab and north of Bimmas. Bring any food or drink you’ll need with you; there is none for sale for miles around. 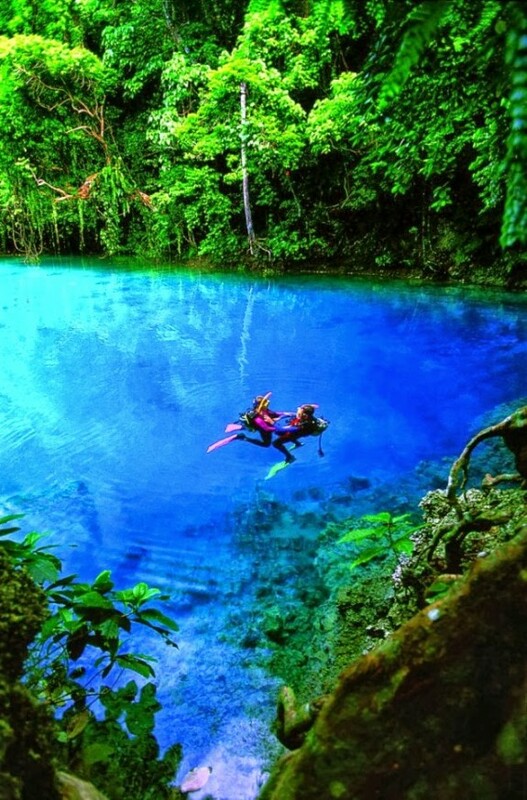 Volcanically-formed Vanuatu is full of swimming holes. All the best ones (that we know of anyway) are privately owned and charge an admission fee. Among our favorite’s is the Nanda Blue Hole, on the western end of Santo Island. Also called Jackie’s Blue Hole, it’s a 13 meter-deep pool of sapphire blue water surrounded by lush greenery. The water slide, rope swing and pool-side bar give it a bit of an amusement park-feel. Also, the water in the pool is a bit chilly (for our tastes). 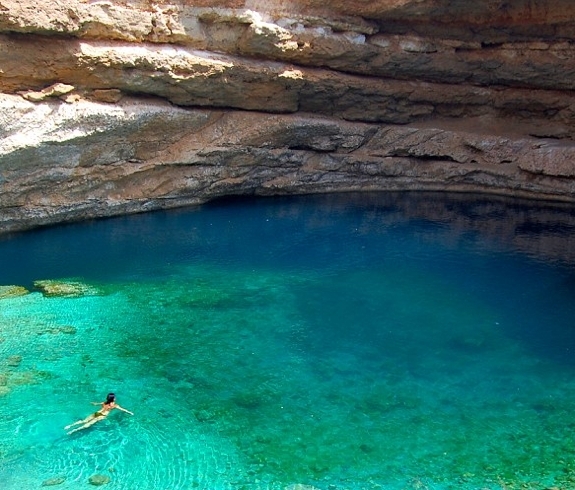 If you aren’t bothered by either of those, the Nanda Blue Hole is heavenly. If you go: Bring the 500vuv (about US$5) admission fee in exact change. 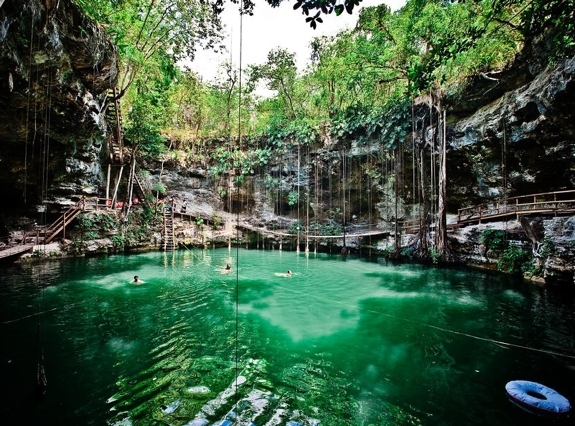 Nowhere in the world has more amazing swimming holes as does the Yucatan Peninsula. 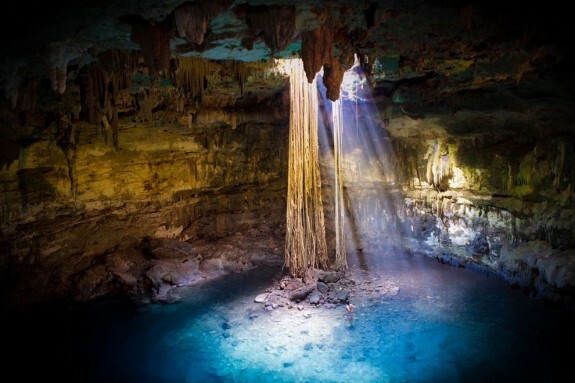 That area of Mexico is home to the vast majority of the world’s cenotes — holes caused by the natural collapse of limestone bedrock that exposes a pool of fresh water. It’s been estimated that there are between 6,000 and 8,000 cenotes around the Yucatan, but no one really knows. Only around 2,400 have been discovered. Which means, there’s plenty of opportunity for you to channel your inner Indiana Jones and discover a cenote of your own. 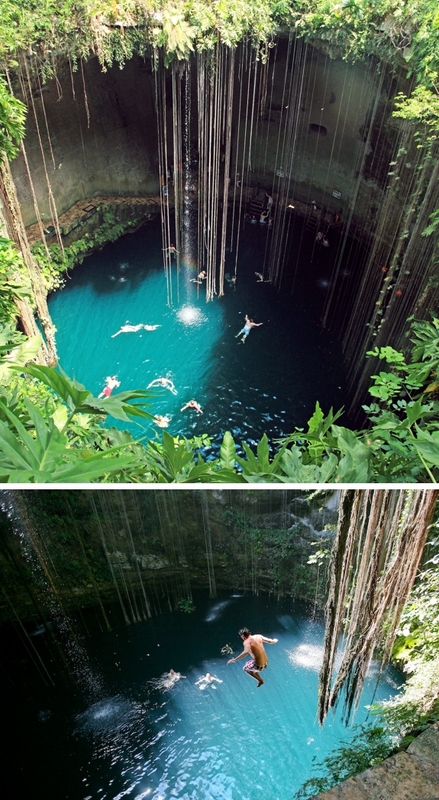 • Dzitnup Cenotes. Both cenotes at Dzitnup, near Chichen Itza, are cavernous and spectacular. Between the multitude of black fish in the water and black bats flying overhead, Dzitnup offer the spookiest cenotes. • Ik-Kil Cenote, aka the Sacred Blue Cenote, is also close to the archeological site of Chichen Itza and is the perfect way to refresh after exploring those ruins. There’s a restaurant at the cenote’s rim and little palapa homes where you can spend the night. • The Tamcach-Ha and Choo-Ha Cenotes, near the Coba ruins, are uncrowded and feature glass-clear water. • The X’Canche Cenote, near the Ek Balam ruins, is by far the least-visited of the centoes on this list despite being nearly as spectacular. You have to pay to enter but use of the nearby hammocks is complimentary. 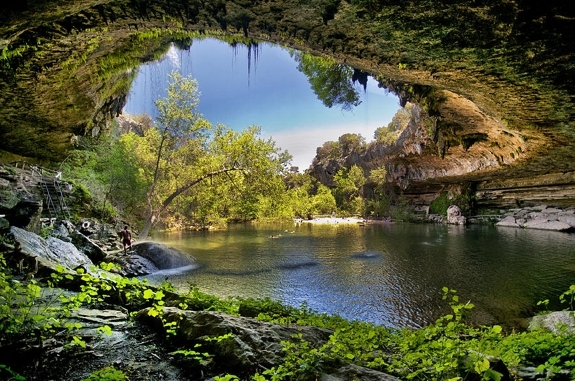 • Dos Ojos is featured in the IMAX movie Journey into Amazing Caves. Though the journey is much more amazing for scuba divers than it is for swimmers. Happily, you needn’t be an expect diver have an adventure here — local guides are available to lead you through the maze-like waters. 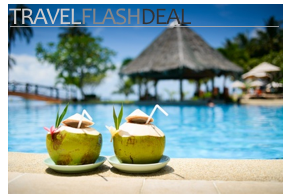 Note that most people would include Gran Cenote on this list. Physically, it is picturesque and, as the name implies, very large. Being so close to Tulum it can also be oppressively crowded. If you go: A good guidebook will have descriptions and the travel particulars of the most popular cenotes. A myriad of companies also run cenote tours. We’ve heard good things about the cenote adventure run by Mayan Ecotours but have no first-hand experience. Oh, yes, the Marieta Islands beach in Mexico must be the world´s most idyllic bomb site! All these swimming holes make me think of the movie Beach..such beautiful secluded gems! I would definitely add also Roca Vecchia in Italy – when I first saw the pictures I wasn´t sure it was real, but then one fine day I found myself tanning in the sun lying on the rocks around this amazing natural pool:) Just make sure you come early to catch a parking spot, because otherwise you´ll only get annoyed an irritated.. This has to be one of the greatest ‘Best Of’ blog posts I’ve seen. 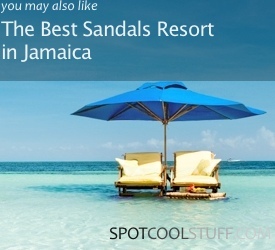 I’ve just added about half a dozen new spots to my bucket list.